We're using the Docker eco system now for a while in development and production. As you may know, the Docker eco system not only consists of the Docker engine (client and server), but it also provides Docker Machine and Docker Compose. While Docker Compose makes linking containers much easier, Docker Machine provides an abstraction for your environment where your Docker engine is being executed in. Thus, Machine allows you to manage your Docker engine Host in a consistent way no matter whether you're on AWS, Azure or on premise - or even your local dev environment. Docker Machine and Docker Compose work together pretty well in production, but when using them in development, you might experience some issues - some of which I'll describe in this post and show solutions for it. This post is not about using Docker, Docker Machine or Compose in production! First, some basics. Let's consider we're composing an Docker application using a MongoDb database and we're implementing a Node.js application that uses MongoDb. By adding the -v $(pwd):/app parameter to our docker run command, we're mapping the local project folder into the /app folder in our container. Now we can modify the content in below our public folder and just hit F5 in our browser to get the latest changes. Changing something in the API and running HTTPIe won't result in updated output. This is because express needs to be initialized again to run the app with the changes made. We have two options to re-initialize the container: restart the container or kill it and run it again. Restarting the container is a single command: docker restart my-node-app-container. Also this command is pretty simple, it may take a few seconds to gracefully stop and start the container. As said earlier in this post, our goal is to have an application that runs on Node.js and uses MongoDb. Using nodemon we can kill and start the containers as shown before and we have a nice development workflow. Now lets go one step further and add Docker Compose to handle the container linking. Using Compose, you don't link containers using the Docker CLI, but instead you create a file named docker-compose.yml (you can name it as you like but the Compose CLI uses this by default). When issuing the http POST as shown above, we'll get a similar result. Refreshing our index.html without restarting the containers still works. This happens because we're mapping the current folder to the /app folder using inside the volumes section of the appliation container definition. This will ensure that changes to the API part of our application are applied as shown before. Now it's time to introduce Docker Machine and show how it plays together with our existing setup. 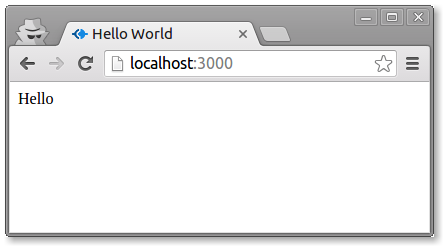 Pointing the browser again to http://localhost:3000 will fail to access the site. VBoxManage modifyvm "default" --natpf1 "default,tcp,,3000,,3000"
Trying to open the website again then will result in the expected Hello World response. This will result, for example, in 192.168.99.100 and pointing our browser to http://192.168.99.100:3000/ will return the expected response as well. The next thing we tried was the usage of Volumes and we'll now try this with Docker Machine as well. But when we try to open the application in our browser, it fails again. Looking at our list of running containers using docker ps doesn't show our my-node-app-container running. Let's dig a bit deeper using docker logs my-node-app-container. The reason for this is that we're telling the Docker engine to map our local directory to the /app folder inside the container. The problem here: our local folder doesn't exist in the Docker Machine default thats running inside VirtualBox. Copying the files has to be done every time our source code changes. Because the scp command is a all or nothing operation, I was looking for another solution that copies only the file changed. One option would be Grunt or Gulp to get the particular file change but I'm not a friend of these tools. A wide spread tool is rsync which exactly does what we want: copy all changed files. The good part of the story: in the end it works. The bad part: There's "a little" work to do. First, to make sure all further rsync commands work as expected, we need to get the SSH key to be used by rsync. In the end, you'll put the rsync command and restarting of the container into a .sh file and call this from nodemon. Running this container together with the MongoDb container works similar to the sample shown in the section without MongoDb but of course with the rsync stuff applied. The last part of this post will show how to run your containers in Docker Machine and get the composition done by Docker Compose. delete the "local" directory inside the Docker Machine using docker-machine ssh default sudo -i "sudo rm -rf $(pwd)"
As suggested in the comments, this update of the post shows you how to use Docker networking which has been introduced in Docker 1.9. Issuing a http post http://localhost:3000/hello name=PDMLab again works fine as before. Docker networking also works fine with Docker Machine, just make sure you follow the steps (rsync etc.) shown above. Docker networking in Docker Compose is experimental at the moment so I won't show that now. P.S. : If you came up with other solutions, please let me know in the comments.